Come check out an exhibition by former Petronas photographer, En. Hatim and single handedly organised by LoyarBurokker Woon King Chai (yes that one of UKM 4 infamy). 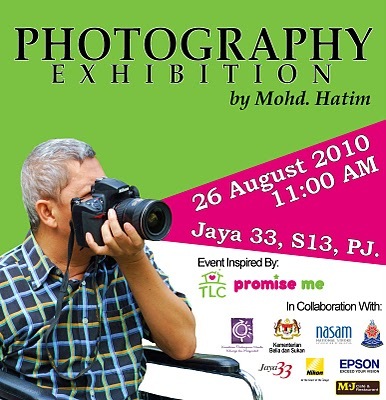 This exhibition will showcase En.Hatim’s photography from across the globe before he suffered a stroke and also from his recent photo shoot outing with Woon King Chai through TLC’s Promise Me campaign. King Chai has taken his pledge a step further by organising this exhibition. We hope to see you there. En. 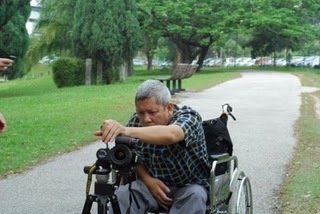 Mohd Hatim was a professional photographer for Petronas for 19 years and suffered from stroke 7 months ago. 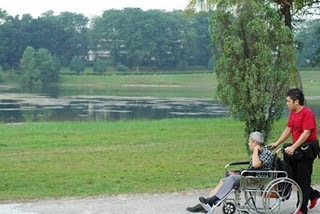 Since then he has been wheel chair bound and unable to do what he loves most: photography. His wish under the The Truly Loving Company’s TLC Promise Me campaign (a youth engagement programme in collaboration with the Ministry of Women, Family and Community Development) was to spend a day out taking photographs with the aid of a tripod stand. His wish became a pledge to which Woon King Chai, a student AIESEC member from UKM, has fulfilled and is going the extra mile in uniting Mohd Hatim with his favourite pastime – by organising a photography exhibition in his honour. The exhibition will showcase his photography masterpieces across the world and also create awareness amongst the general public regarding the challenges and problems faced by stroke victims. Friends and family from Kluang and members of Kluang Country Club who generously donated to this initiative and sponsored the exhibition materials. En. 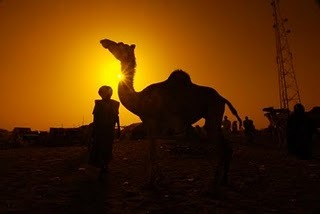 Hatim taking photos with the assitance of a tripod and his son.